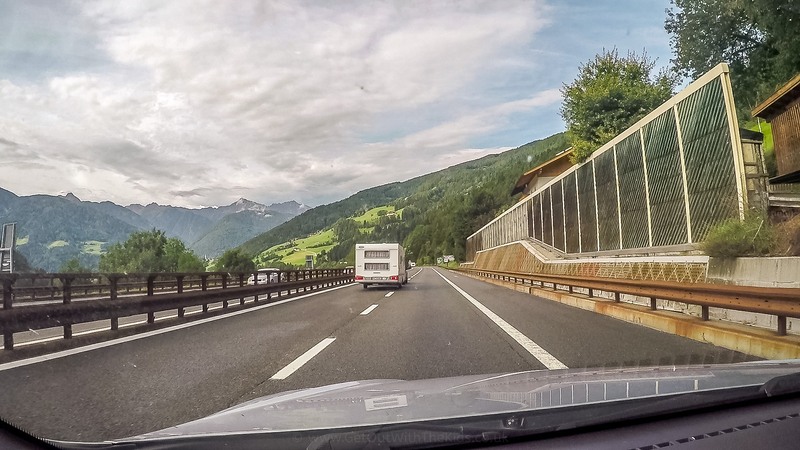 In our original planning, there was a direct route through the Alps that many people on caravan forums said was very picturesque and achievable with the caravan…even though looking at Google Maps, there were many hairpin bends. Fortunately, it mainly took the route of valleys rather than climbing up and over the mountains. However, our Garmin ‘Camper’ SatNav said “No“, and recommended a route via the Austrian Autobahn and Italian Autostrada. This was a much further route distance wise, though not much difference in time. Since this wasn’t our caravan, we erred on the side of caution and took the Garmin’s recommended route. There’s not much difference as you move from Austria to Italy, apart from the road signs and barriers change slightly. The houses still have that Alpine look, and there are still castles and monasteries dotted around the hill sides. Of course, it wasn’t long before we saw signs for pizza in the towns. As we continued to head south, the houses become less Alpine and more classic Italian. The mountains also changed shape slightly, rising as large mountains from flatter countryside. We had made it to the Dolomites region. Oh, we also passed the Ferrari museum! After a while, we left all the mountains behind. Italy was now much flatter, hotter, and busier. By this time we had reached our first toll of the entire journey. Not bad considering how far south in Europe we had travelled. This was a painless process and just required taking a ticket from an automated booth and paying it many miles later once we reached the Venice area. 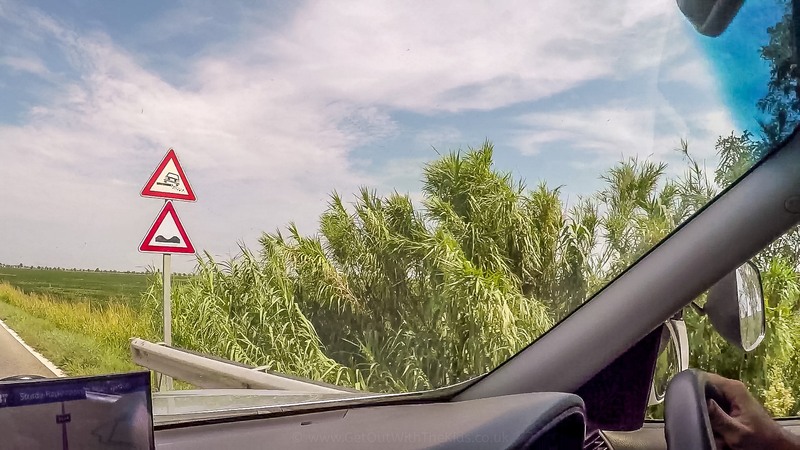 The Autostrade takes you through the Venice region, but you don’t see Venice. Instead, you pass near the Airport and lots of industrial estates. This is not the most exciting drive, but we started to recognise it from our previous visit many years before, and knew that the end was near. To get to Camping Ca’Savio, you have to take a long way around. 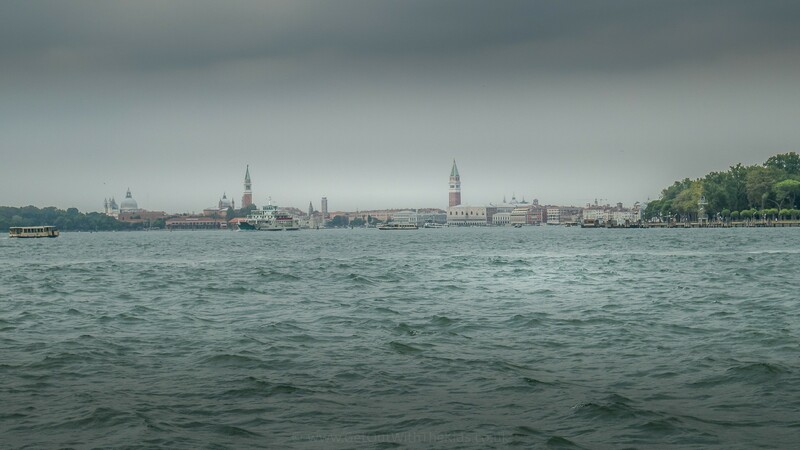 It’s actually on a piece of land that separates the Venice lagoon from the sea, and it can take a while to get there. The check-in with the caravan at Caping Ca’Savio was very efficient. We were directed to where we could temporarily park our car and caravan while we went off to choose one of the pitches we had available. We chose a fantastic pitch close to the pool and facilities, and just a stone’s throw from the beach. The pitches were a lot larger than we remembered, and perhaps one of the biggest pitches of all our European campsites. 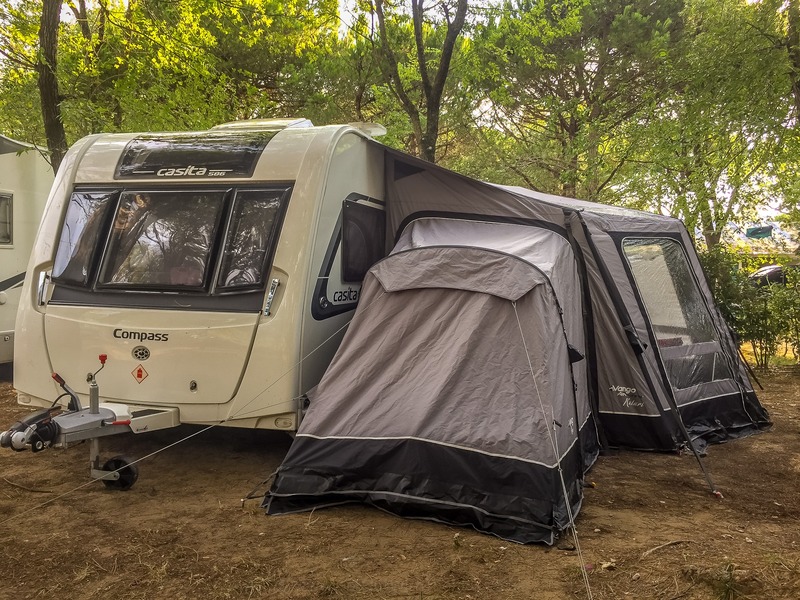 Many caravans pitched sideways between the trees, but that wasn’t a requirement, and so we pitched it ‘UK Style’ with the hitch at the road side to make it easy to manouvere and get the caravan in out. In hindsight, pitching it sideways on might have given us a bit more space to sit outside. 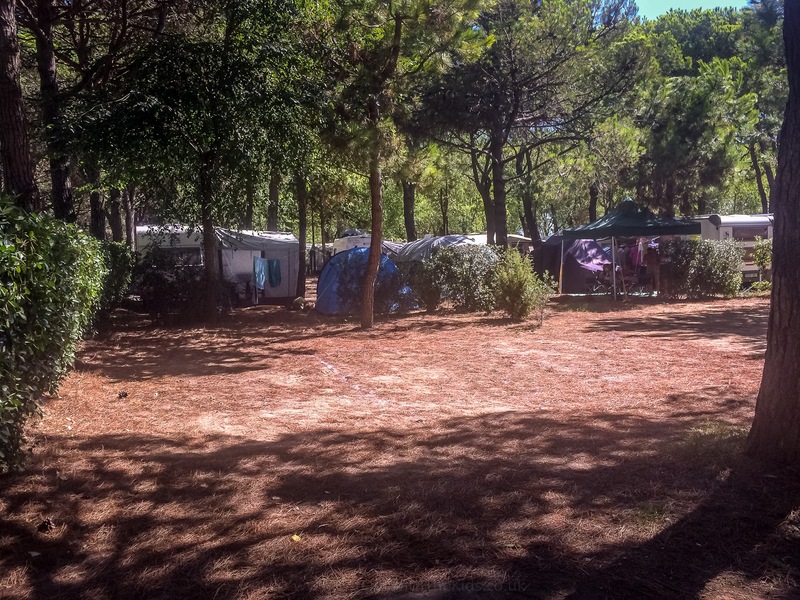 This campsite is large and is a major holiday resort for people all over Europe. 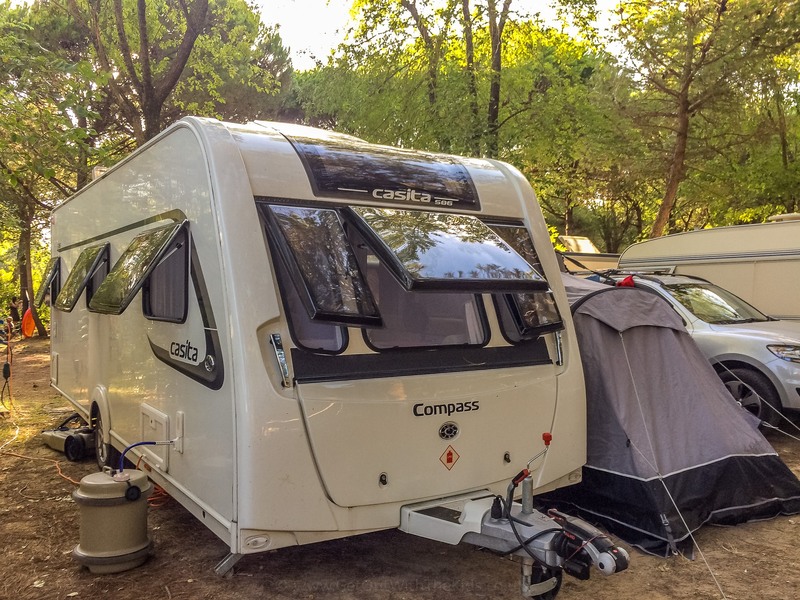 Most of the British visitors fly in, though we did meet another family that also towed their caravan down, as well as seeing a large UK Elddis motorhome. 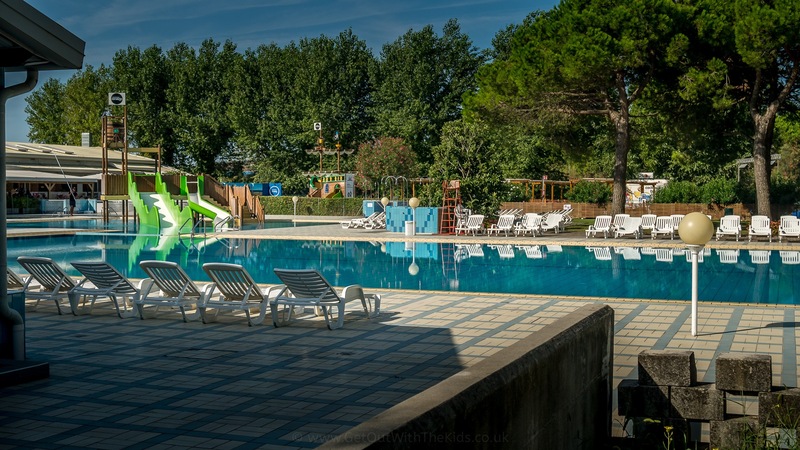 Being a large campsite, there are plenty of swimming pools, a kids club, a pub, a pizza restaurant with fresh baked Italian pizzas (which also does takeaways), and a supermarket with excellent local and Ca’Savio branded wines. The showers are basic but free. You’ll also need to take your own toilet roll to the toilets. The only real struggle was to find a water point. 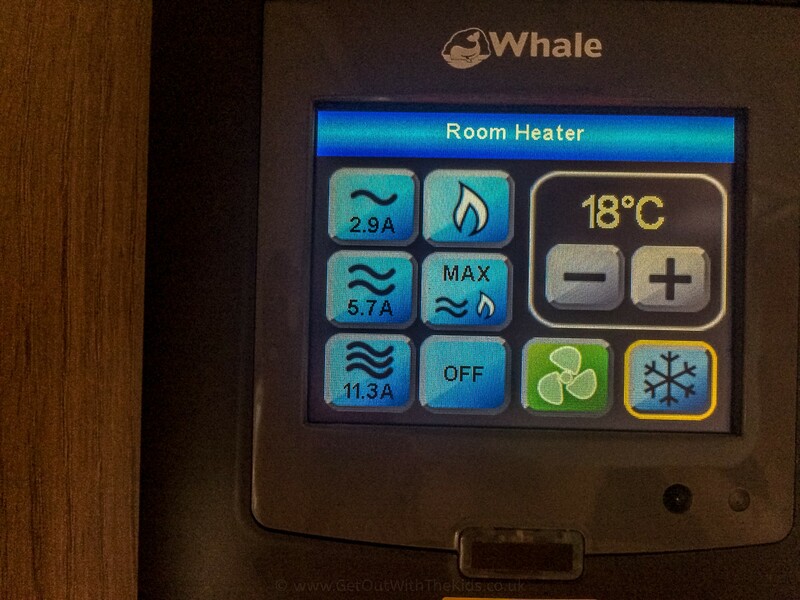 However, the facilities were just a row down from us and was the best place to fill up our Aquaroll. 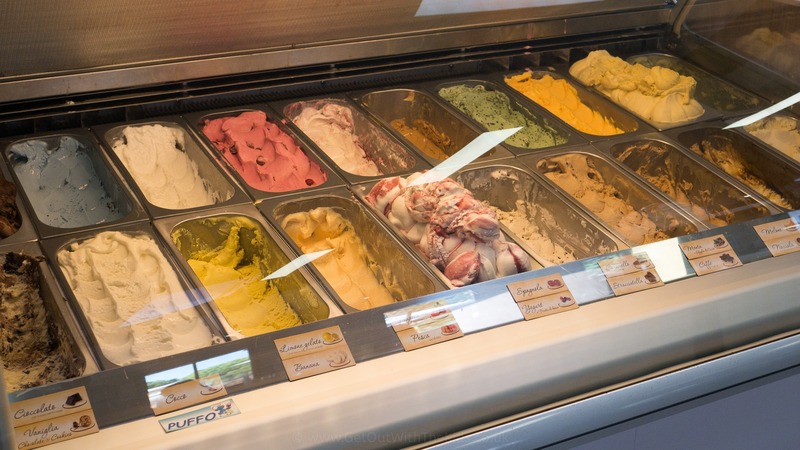 As well as great swimming pools, the kids loved the fresh Italian pizzas and ice creams! There’s also a great supermarket on site. Of course, if you don’t have your own caravan, you can fly there and stay in one of their static caravans, pre-pitched tents, glamping, or even in their Airstream caravan park. 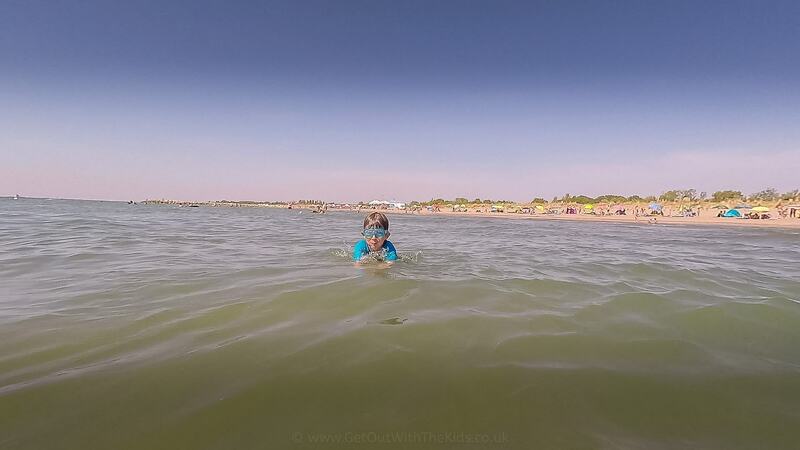 Oh, and of course, the beach was accessible directly from the campsite. Camping Ca’Savio has a large sandy beach. Without airconditioning in the caravan, I was worried it was going to be uncomfortably hot. We had stayed at Camping Ca’Savio in the past in a static caravan, and knew how hot it could get. However, this wasn’t a problem with a Compass Casita, as there were plenty of windows and sunlights to open. We could also use the caravan’s heater as a cool-air fan. All those times we’ve been using this to heat the caravan during the winter, and now it was being used to keep the caravan cool instead of warm! This is the second time the kids have visited Venice. 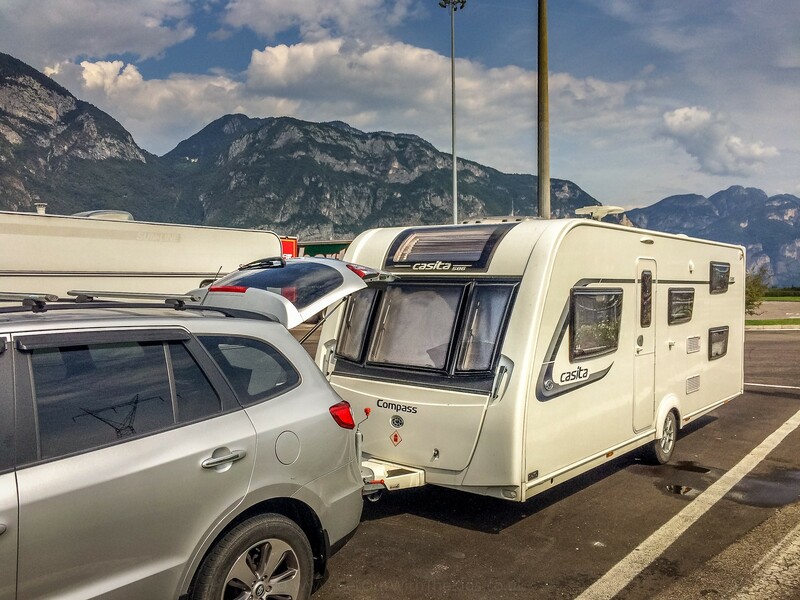 The first time, we stayed in a static caravan at Ca’Savio, and this time we brought our own! 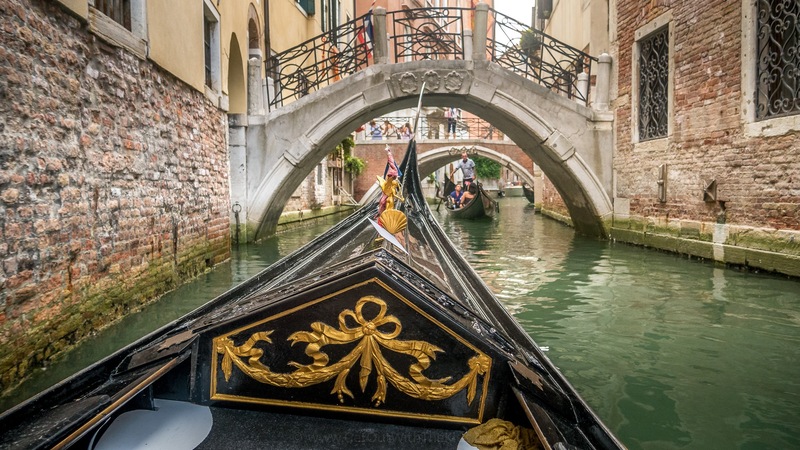 Getting to Venice is easy. 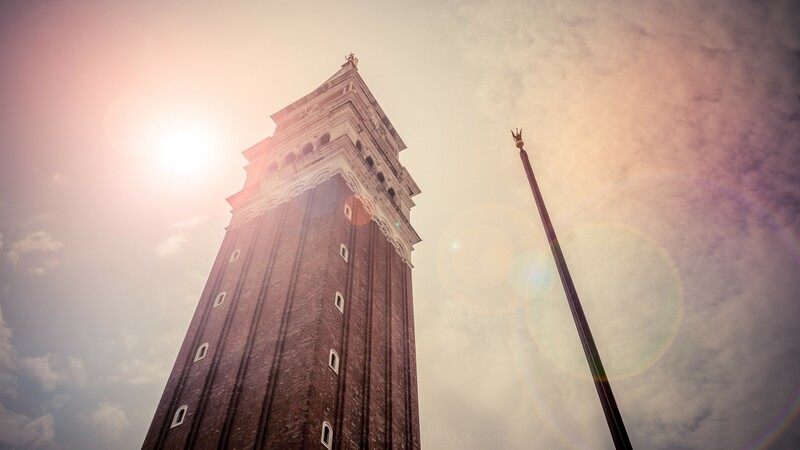 It’s only a short bus ride to the ferry terminal, and the ferry then takes you to St. Mark’s square. Venice is very busy and very expensive – if you eat in a restaurant there. However, after you’ve seen the main sights, head off to the back streets. You can find some great pizza places where you can pick up some slices to eat on the go, plus there are also a few supermarkets around. I love the faded charm of the Venetian back streets. Taking a gondola ride around the back canals of Venice. 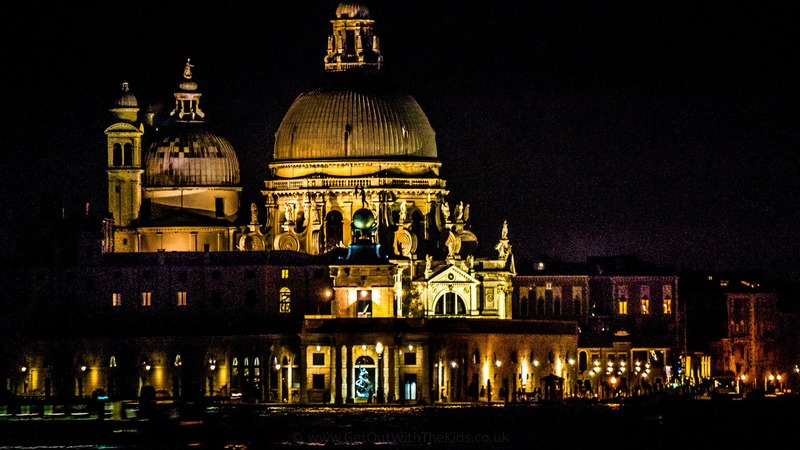 And of course, Venice is just as picturesque at night. 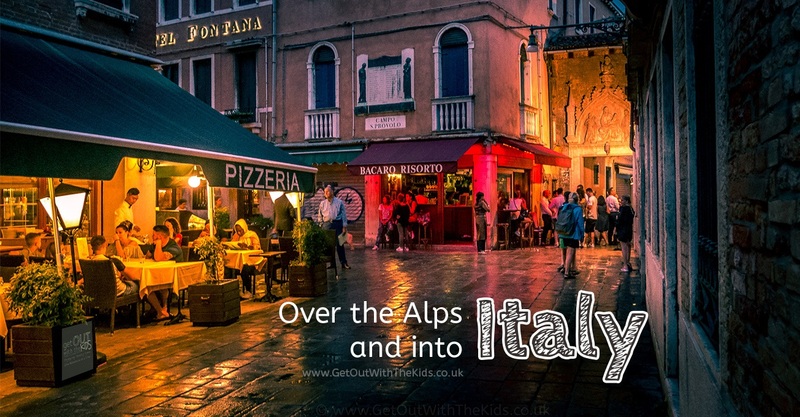 It’s amazing to think that we travelled all the way with our caravan from the ancient medieval town of Shrewsbury in the UK to the ancient medieval city of Venice in Italy.